Anti-Poverty Advocates Brace For How Trump Will Fill In Policy Blanks Many who work with the nation's poor worry that poverty will be forgotten under a Trump administration and Republican-controlled Congress. 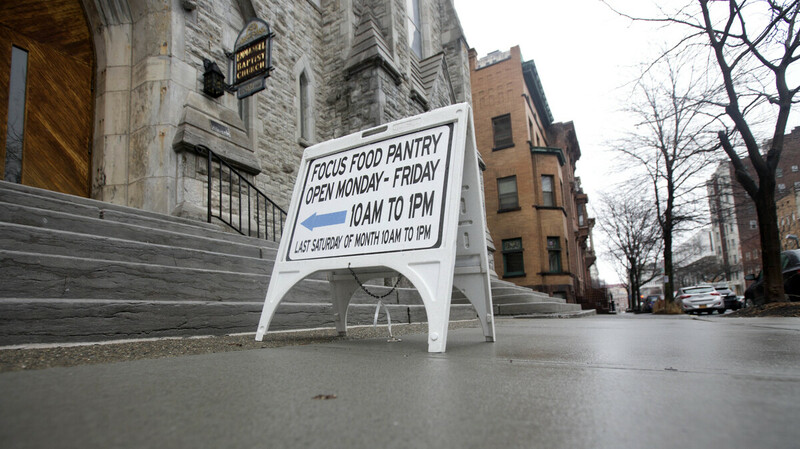 A sign sits on a sidewalk outside the Interfaith Food Pantry at Emmanuel Baptist Church in February in Albany, N.Y. Congress may be under more pressure than usual to cut safety net spending — health care, housing assistance, welfare and food aid — to help pay for Trump's tax cut plans. Poverty was one of the forgotten issues on the campaign trail this election season. Now, many who work with the nation's poor worry that it will be even more forgotten under a Trump administration and the new Republican Congress. Mariana Chilton, who runs the Center for Hunger Free Communities at Drexel University, doesn't remember Donald Trump saying much about poor people during the presidential campaign, but she does remember a comment he made about a protester who was being removed from one of his rallies. "You know it's amazing, I mention food stamps and that guy who's seriously overweight went crazy," Trump said, as the crowd cheered. "He went crazy." Chilton thinks such comments by Trump have set a tone that will very likely spill over into his administration. "What Trump has done is he's brought out a lot of vitriol about people of color, people living in poverty," she says. "And that kind of attitude will make it easier for the Republicans to cut health care benefits and food stamp benefits for the most vulnerable Americans." She thinks that Congress will be under more pressure than usual to cut safety net spending — health care, housing assistance, welfare and food aid — to help pay for Trump's massive tax cut plans. Republicans have been especially critical of the $70 billion the federal government spends each year on food stamps, now called the supplemental nutrition assistance program, or SNAP, although Trump has yet to say what he'd like to do about it. "For the first time in many years, I would say in decades, it's not clear to us what the president-elect thinks about federal nutrition programs, and they are essential for people facing hunger," says Diana Aviv, CEO of Feeding America, a network of 200 food banks around the country. The Census Bureau says that last year alone, 4.7 million Americans were kept out of poverty by food stamps. Still, Aviv sees a silver lining in the fact that the president-elect has said so little about poverty. "Sometimes not talking about things means that there's more flexibility, more opportunity," she says. And in this case, that means more opportunity for groups such as hers to influence the debate, especially as Congress works on upcoming spending bills. Robert Woodson, president of the Center for Neighborhood Enterprise, which helps low-income communities address their problems, also sees Trump's lack of specificity on poverty as a plus. "That means the Trump administration will be open to listening to seasoned veterans like [House Speaker] Paul Ryan," he says. Woodson has worked closely with Ryan for years, helping him draft an anti-poverty agenda that would streamline spending and give more authority over safety net programs to the states. Ryan has also proposed imposing time limits and work requirements on those getting aid. "Paul Ryan is one of the few figures that is exploring pathways for people to get out of poverty and away from dependency and to become self-sufficient and independent," Woodson says. While many anti-poverty advocates don't like Ryan's approach, they are encouraged that at least he's talking about trying to find some way to help the nation's 43 million poor people. Deborah Weinstein, who heads a coalition of more than 100 national anti-poverty groups, says she doubts that dealing with the safety net will be one of Trump's initial priorities, and that's an advantage. "That gives us time to mount an effort to be the strongest possible voice" against dismantling programs, such as SNAP, she says. Weinstein notes that there are some areas where Republicans and Democrats might find common ground, including expanding the Earned Income Tax Credit for low-income workers and providing more education and job training to help people get out of poverty. "One question is who will he be listening to," she says. For that reason, she and other anti-poverty advocates are watching closely to see who Trump picks to head agencies that oversee the safety net, such as the Department of Health and Human Services.